It looks like we may get some rain. This thing wasn't even on the weather map yesterday -- just a cold front going headed south aiming for a ridge going north. Then this morning we turn on the news and a large spinning mass is drenching Galveston and ruining my commute. A little later on they declared it a tropical storm and named it Humberto. 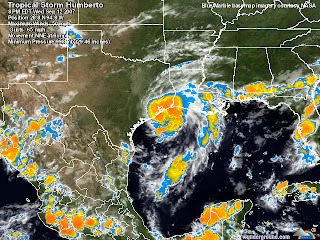 Right now the thought is Humberto will come ashore north of Conglomeration, TX around 2:00 a.m. with 50 mile an hour winds. Then it will hook to the right and head for Louisiana. Under that scenario we should not be hit too bad, but the feeder arms could still give us some nasty storms and occasional tornadoes.